It’s that time of year, the weather cools and the sports switch out. Color guard is ending and Winter Guard tryouts begin. 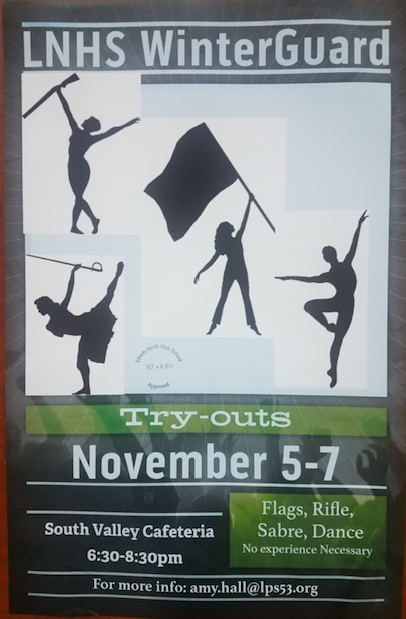 Tryouts for winter guard are November 5-7 at SVMS cafeteria,” junior Sam Federoff explains. Though Winter Guard and Color Guard share many similarities, they vary on a couple of key points. “Winter guard is basically the winter version of marching band guard. But instead of us being with the band we are all on our own and we go to competitions with other schools winter guard teams.” Federoff said. While Winter guard is a good athletic opportunity it also supplies a community. “It’s a great time to bond with other people with the same passion as you and learning something super fun and new. You learn how to toss and spin a flag as well as a rifle and a saber. It’s a good way to become a team and make new friends. It lasts through March/April and it’s a way to watch other groups and their skills and apply it to yourself. “ Federoff said.